What is it that keeps us going? Is it our self-motivation or is it peer pressure? Is it both? Is it something completely different? High aspirations can push you forward or hold you back. They can make you do better than ever and enjoy the things you do. They can make you feel deeply desperate about a world that does not share your ambitions and work-pace. Both perceptions notably occur when working in groups is involved. How do you know, that you are doing well? Take an individual grading based on grading scales from 1-6 or 0%-100%. The basis is provided for continuous competition. Whether this grade says anything about how much you know or how well you are doing – it is a measure and it is recorded. For group work one could implement the possibility to opt for individual and group grading (meaning that individual contribution was made visible within the group project). Switching to a Fail-Pass-Pass-with-Distinction system has been thought-provoking for me lately. Not about grading systems but about what and who defines others as doing well and how this influences individual/group behavior. Giving the pass-fail approach – I had an interesting discussion with two of my peers. How can we distinguish transparently between those that do good and those that do better? Is it simply enough to know that ourselves (how transparent is this then)? Or is it enough that the lecturer knows it and will keep that in mind for possible future PhD applications (if so, what is the benefit if someone does not want to stay in the research environment)? This might work if everything goes the way we expected it to be. But what if there is doubt and for a pass-fail decision there is no objective comparison between „competing“ students at hand? Reflecting these questions it seems to me, that – independently of the grading system – we are focusing so much on the output of a learning process and forget the process itself. able to memorize the way work was done and can compare different projects unbiasedly. But to be honest, this is not how real life always treats you – and as mentioned before – we are again outcome oriented. What really happens when it comes to group work is more complex than it could be measured by comparing final results. Take the social loafing phenomena (described as the loss of motivation when working in groups compared to individual work where work results are not merged): „hiding“ in a group and not participating (because „the rest“ will to the work) could be best prevented by setting an attractive common goal, increasing group identification and making each individual visible by avoiding incognito states (as we loaf because we expect others to do the same and try to preserve equity, because we feel anonym and not to be identified and because there is a lack of performance standard). I am not talking about output; I am talking about the group working process. On the other hand, there is this phenomenon of social compensation. This basically is the opposite of social loafing. People engage even more in group work because they know/assume/fear that co-workers/peers won’t/can’t work hard enough to reach the set goals. [Hogg, Michael A.; 2011] Once more, the route roote cause is the process of work, not the result. In addition, a very simplified second conclusion is that it is the individual recognition that counts towards connecting aspirations and our motivation to stay focused and on track. To support the individual learner and the group outcome one solution would be to detect issues in the working processes before the result is presented. Definitely, we could rely on the group members to be objective and report such issues or on the lecturer/department leader to identify and sense tensions. But is this realistic taking into account the vast amount of technology used and communication around the project that is transferred to the digital environment? You cannot just trust your eyes and ears anymore, but you must be able to analyze patterns group members follow while using technological support. In addition I am not talking about storing (intermediate) results (as I do it in this blog here for example). I am talking about the factual analysis of user data to identify patterns, workloads and routines. In anticipation on the critiques: yes, one could argue, that this is the control/observation/tracing of people by using information technology and data analyzing features. I want to argue that because people use information technology we need data analysis to acknowledge their work in the digital space. Which leads back to the high aspirations mentioned earlier: just because I try to be as objective and unbiased about others and their work – may I assume that others try that is well? Should I set a good example and trust in others to evaluate the work done as a whole? If I do answer yes to all of these questions, does that mean I should not try to evaluate work more objectively? And when work becomes more complex, especially the progress until we reach a certain outcome, should I not use information technology (for the good cause) to improve my objectiveness? 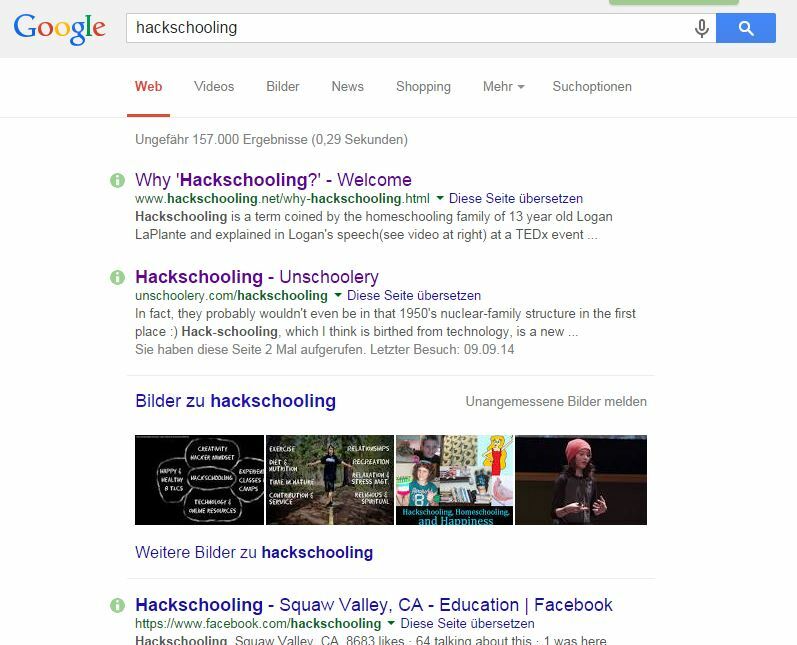 I first came across the term „hackschooling“ when watching the TedxTalk „Hackschooling makes me happy“ by Logan LaPlante at TEDxUniversityofNevada from February 2013 (which has 6.1 Million views by now). While doing some research on the term „hackschooling“, it struck me that there is apparently no (official) academic article published focusing on it. Is this because hackschooling fits perfectly within the unschooling/homeschooling classification or because it has not been recognized so far? If it does fit – how does it fit? How is it related to these terms and where does it differ? How is hackschooling defined? Due to a lack of academic resources, my attempt to answer these questions is based on grey literature such as blogs, videos and websites. Since my university’s library search resulted in one source only , and google scholar made it to eight in total, from which I could use one , I turned to Wikipedia and Google. Wikipedia does not list hackschooling. When entering this term in the search engine, it simply refers to „Homeschooling“. Would there be any resource available, which could offer a definition or try to put hackschooling into a broader perspective? 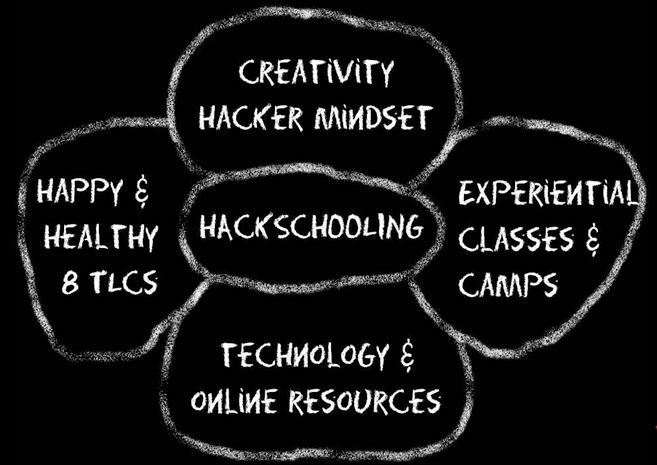 Hackschooling is seen as the center of the four elements „Happy & Healthy / 8 TLCS*“, „Creativity/ Hacker mindset“, „Experimental classes & camps“ and „Technology & Online Resources“. Hacking is described as innovative and as to challenge an existing system. Hackschooling as mindset, not a system that can be used by anyone, even schools. After the initial browsing, I selected 20 web sources based on the above criteria. Surprisingly, most of them only explain the term „hackschooling“ very vaguely (if at all: by citing the video) and seldom relate it to other alternative education ideas (e.g. unschooling, homeschooling) by giving detailed information on why they mention this relation. The vast majority reports on the Ted Talk, only two are giving opinions and critical approaches to think about it. Out of 20 resources, a connection to unschooling could be found in two sources [1, 16], a connection to homeschooling in 10 [2, 3, 4, 7, 8, 9, 10, 11, 13, 15] a definition only in seven [5, 6, 12, 14, 18, 19, 20] and two sources did put hackschooling in a broader context [16, 17]. Open questions and what’s next? First of all it would be pretentious to say, that the resources used represent the unitary point of view on hackschooling. Rather do they represent a point of departure for future investigations. But still – these first results mentioned above are leading towards some open questions. In conclusion, I am very surprised that no author tried to be more specific in what hackschooling is and where it can be placed within the educational environment. It might be, that this definition and classification is so obvious, that it is not worth mentioning it. It might as well be, that by leaving out lines of argument these resources miss an important point: defining hackschooling is harder than simply reporting on it as „just another form of homeschooling“.